Lew was married at least three times. His first wife was Maurine, they had one child - Elmer Gene Ray. Emma Cook was his second wife, they had one child as well - Robert Louis Ray. And his third wife was Mary. Mary had a child from a previous marriage. Mary and Lew also divorced but had plans to remarry when he was killed at work. Lew lied about his age and enlisted in the Navy after his mother passed away in 1919 (Little Rock, Arkansas). I have not yet found an military records for him during this time. My mother can remember Lew telling her that he had a daughter named Patsy from this time period. No one seems to be able to confirm this. Lew Wade Ray can be found in 1920 Census in Camden, Arkansas with his uncle and aunt. He lived in Detroit with his wife Maurine and son (Elmer) Gene Ray. It appears that his brother, Elmer Garland Ray was the first of the 3 siblings to move to Detroit, in search of employment, we believe. Ruby and Lew followed Elmer. I am unsure of where Lew and Emma, my grandmother, and his second wife, meet. My great aunt Betty Jo tells me it was during a flood in Padacah, but my great aunt Opal believes it was in Detroit. Emma and at least one of her sisters, Datha, lived in Detroit for a period of time. My father started elementary school in Mich. but soon Emma came to live in Granite City, Illinois where her parents Cora and Jasper Cook had relocated. Seems many of the Kentucky ancestors moved north for employment. Grandfather Lew died as a result of an accident at the railroad loading dock where he worked. Although he was working in Cincinnati, Ohio; his residence was 624 Overton Place, Newport, Ky. (Campbell County). He was taken to Detroit, Michagan where his 2 siblings lived for burial at Forest Lawn Cemetery. Notes: Lew Wade Ray lived for a while in Detroit and that is where his second child, was born in 1938. Lew was known for his ability to gab. He might go out for a newspaper and be gone for hours. Additionally, at one time he worked at a dry cleaners and was known to be a very neat and sharp dresser. This really shows in several of the photos that he had taken. My dad can remember when Lew played on the radio in St. Louis with his cousin, "Wade Pappy Ray". Wade is a well known fiddle player but I have never figured out how distant of cousins these 2 men were. There is a fiddle "fest" in Sparta Illinois each summer to honor Wade "Pappy" Ray. Lew was also known to perhaps run a little liquor through Southern Illinios during prohibition. Grandpa must have been quite a fella. I was the only one of his grandchildren to see him but was less than 2 years old when he passed away. I have never found a photo of me with Lew but I do have his Bible and found a copy of a photo of my dad and me in within the pages. Spouse Notes: Maurine divorced Lew on the 9th of April 1931 in Pulaski County, Arkansas. Case # 43706. 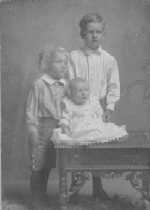 One child was born to this marriage - Elmer Gene Ray aged 3 at the time of the divorce. Spouse Notes: A tall, thin woman, I could never understand when my grandmother would tell me that her doctor kept her on a diet and she couldn't eat certain kinds of foods. I can remember grandma telling me she was on a diet and I replied "but grandma, you're so skinny". Grandma just laughed and laughed, it wasn't until many years later that I understood that she was ill and had to watch what types of foods that she ate. I can remember going to Grandma's house on East 27th Street in Granite City for Christmas and how everyone was so crowded into the house but how everyone had such a good time. Others tell me that the family decided to have a round robin type of Christmas, you would eat a course of dinner at one house and move the party on to the next house to continue dinner. I can even rememeber when she bought me a jack in the box with the crank handle that played a tune and jumped out of the metal box to surprise you. I spent alot of time with my grandmother. As a kindergartener, she was my Sunday School teacher. I can see in my mind's eye, Grandma sitting in a little chair singing, "This is the way we wash our face ..."
Grandma and Grandpa Harry (My father's stepfather) and Aunt Dorothy moved to Edwardsville, Illinois for about 5 years when I was young. It was the country and Harry had a huge garden. When Grandma's health worsened, they moved back to Granite City to be near the hospital and her doctors. Grandpa cooked, cleaned and did the laundry, he was a pretty good "wife" by most standards. I was 10 when Grandma Emma passed away. It was right before Christmas, and on Christmas Grandpa Harry brought the gifts, Grandma must had known she wouldn't be able to deliver herself.